What Day Of The Week Was April 1, 1949? 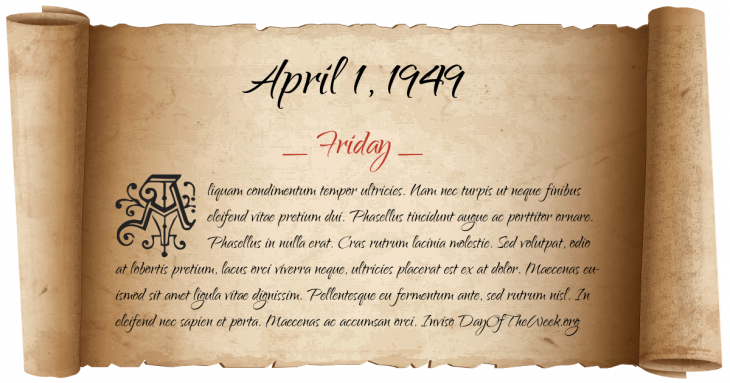 April 1, 1949 was the 91st day of the year 1949 in the Gregorian calendar. There were 274 days remaining until the end of the year. The day of the week was Friday. A person born on this day will be 70 years old today. If that same person saved a Quarter every day starting at age 6, then by now that person has accumulated $5,849.25 today. Here’s the April 1949 calendar. You can also browse the full year monthly 1949 calendar. Chinese Civil War: The Communist Party of China holds unsuccessful peace talks with the Kuomintang in Beijing, after three years of fighting. The 26 counties of the Irish Free State become the Republic of Ireland. The Canadian government repeals Japanese Canadian internment after seven years. Who were born on April 1, 1949?